Even as earlier efforts of switching over to spot billing proved to be a complete failure, the Himachal Pradesh State Electricity Board has introduced fresh experiment with the system, which it intends extending to all urban areas of the state. The people of Himachal Pradesh almost depend upon its neighbouring states like Punjab and Haryana for milk supply and they have to compromise with the available efficacy and purity of this commodity, thanks to the apathy of the state government. Chief Minister Virbhadra Singh today denounced the act of affixing of posters in the court complex in Chamba town and said this was a condemnable action of some miscreants who would be brought to the book shortly. Mr Virbhadra Singh, Chief Minister of Himachal Pradesh, has said that the state government would ensure all basic amenities to the people in the Changar area and added that development of difficult and far-flung areas was on priority of the government. The state government has given the go-ahead for a bypass to McLeodganj and a parking lot in the heart of the city. The two projects are aimed at giving impetus to tourism in both Dharamsala and McLeodganj. 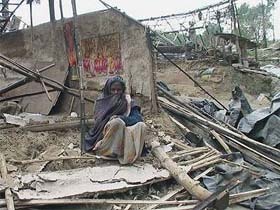 Nearly 200 persons living in about 200 jhuggis in the protected forest area of the town near the Housing Board colony, were evicted and their jhuggis were demolished by the Department of Forest here today. A team of the forest department, consisting of 20 persons, led by Deputy Ranger Mukhtiar Singh monitored this operation. A retired Deputy Director, Health Dr Ram Singh Sharma, who used to stay alone at his Kalri village, 2 km from the tehsil headquarters of Ghumarwin in Bilaspur district, was found murdered at his house on Saturday night under mysterious circumstances. As many as 35 persons were injured when a private bus skidded off the road due to snow and fell into a khud near Lambidhar, about 20 km from here, this evening. Even as earlier efforts of switching over to spot billing proved to be a complete failure, the Himachal Pradesh State Electricity Board (HPSEB) has introduced fresh experiment with the system, which it intends extending to all urban areas of the state. Launched with much fanfare, spot billing started by the HPSEB on an experimental basis in the City Division-I of the capital in 2002, failed to take off as it proved to be more expensive and complicated than the manual system itself. As a result, in most of the places the hand-held spot billing machines have been abandoned and it is once again back to manual system of taking reading and later preparing the bills. A total of 10 machines, each costing Rs 13,000, were purchased for the experiment which was started for the first time in 2002. Still keen to adopt the spot billing system, the HPSEB has once again introduced the system in Khalini sub-division falling under Charlie Villa division of the town. It is learnt that the board has purchased 20 more such machines from an Andhra Pradesh-based company, who have tried to rectify the problems faced earlier. "We already have computerised the billing system in Khalini area, covering over 15,000 consumers and we intend to extend it to Dhalli sub-division within the next three months time," informed Deputy Chief Engineer (South), Mr K.S. Kanwar. He was hopeful that gradually the Board would be able to extend spot billing to all urban areas of the state. Plagued with the problem of staff shortage engaged in revenue collection, the HPSEB's ambitious plans of extending spot billing system to at least the urban areas of the state failed due to the complications and technical problems in the system. The staff engaged in the job point out that the earlier machines gave lot of problems as they had to be recharged after printing few bills and gave errors which could be rectified only at the computer cell. Spot billing system had basically been introduced to tide over the problem of staff shortage as extra employees would not be required to first take the metre readings and then later prepare the bills and get them distributed. On the contrary, due to problems being faced in taking the meter readings and their print outs, the HPSEB has been forced to revert back to the manual system in the City Division. It remains to be seen now whether the fresh experiment with computer system will prove to be successful and bills are distributed in time and improve revenue collection. The people of Himachal Pradesh almost depend upon its neighbouring states like Punjab and Haryana for milk supply and they have to compromise with the available efficacy and purity of this commodity, thanks to the apathy of the state government. None of the state governments ever thought of promoting its own dairy sector. According to an estimate, Himachal Pradesh is the only milk consuming state having its contribution in its production merely 8 per cent of the total milk being consumed annually approximately costing Rs 100 crore in the state. But now with the initiative of a young entrepreneur, Mr Rakesh Pathania, a white revolution is coming up in Kangra district and “Himachal Fresh” milk will hit the market in February. This venture is being undertaken on the pattern of milk cooperative movement of Anand in Gujarat jointly with “Mango Dairy”, Jassur, near here, and cooperative societies named Nurpur Young Dairy Farming Associations having youths and women the members. According to Mr Pathania, the white revolution will create self-employment opportunities in the region as milk has sure market in the state. He claimed that this dairy, sprawling over an area of 73 kanal, is the first of its kind in the northern states in which the whole process from milking to packaging will be done with the advanced computerised Sweden technology. “The people of the state, initially of Kangra district, will get pure, hygienic and fresh milk at their doorstep”, he added. He said the dairy would have its own high-tech feed production unit, quality control laboratory and veterinary health services and moreover, the farmers joining the white revolution would be provided advance dairy farming knowhow as well as dairy produced feed and veterinary services. Apart from this, the farmers can sell their green fodder and feed to the dairy, he added. Mr Pathania said that by the end of 2005, the dairy would produce 30,000 litres of milk per day. He was replying to a question during a ‘Meet the Press’ programme organised by the Trigarth Press Club here this morning. He said the state government held judiciary in high esteem. He said he was completing the first phase of his winter sojourn of Kangra and was fully satisfied that its aim was being achieved in the right spirit. He said developmental projects here were in full swing. He said allegations by the BJP of alleged bias against Kangra had proved ‘misleading and mischievous’. He said BJP Chief Minister P.K. Dhumal had laid stones for a number of projects for which there had been no budgetary provision. So there was no possibility of these projects being completed, he said. He, however, said some major projects had been revived and budgetary provisions made by his government. He alleged the infighting between Shanta Kumar and Dhumal factions in the BJP had affected the development projects in Kangra district during the BJP regime. He dared Mr Dhumal to discuss the issues of disparity with Kangra district and said he was prepared to discuss all such issues on the floor of the Assembly. Replying to a question on monkey menace issue, he said the government was purchasing laser machines for conducting sterilisation of monkeys so that their number could be reduced. The Chief Minister was accompanied by Revenue Minister Sat Mahajan, Chief Parliamentary Secretary Mukesh Agnihotri and local MLA Surender Kaku at the press conference. He was addressing a public meeting at Khawa village in the interior of Changar area of Kangra subdivision last evening. The Chief Minister said that the difficult and backward areas in lower hills, which were called as Changar, and Kandi areas had been accorded special attention by the government by formulating various programmes for their development. He said that special budgetary provisions were being made for the purpose. He said that special emphasis was being laid on providing road connectivity, educational, health, drinking and electricity facilities. He said that the government had provided tehsil to Changar people at Baba Badoh so that people of the area did not have to travel to Palampur or Kangra for their revenue-related works. The Chief Minister announced Rs 15 lakh for the construction of Kandi motorable bridge which would add to the road connectivity facilities to the people of the area. Mr G.S. Bali, Transport Minister and local MLA, welcomed the Chief Minister and thanked him for providing funds for the completion of the Khawa khud bridge and dedicating the same to the people of the area. Mr Sat Mahajan, Revenue Minister, Mr Mukesh Agnihotri, Chief Parliamentary Secretary, Mr Jagjivan Pal and Mr Sudhir Sharma, MLAs, and Dr M.R. Goma were also present on the occasion. The state government has given the go-ahead for a bypass to McLeodganj and a parking lot in the heart of the city. The two projects are aimed at giving impetus to tourism in both Dharamsala and McLeodganj. Those coming to McLeodganj will now be able to head straight to their destination, without entering the Dharamsala market. Talking to The Tribune, local legislator Chandresh Kumari said they had already got approval for both the bypass and the parking lot. “The bypass was a long-pending demand and the proposal was prepared all over again after it was rejected once. We have also got approval from the forest department for transfer of land,” she said. Starting from the Dharamsala Inter- State Bus Terminus, the 2.5 km-long bypass will merge with the old Chari road and eventually end at Kalapul, nearly 6 km before McLeodganj. It will be constructed at a cost of Rs 50 lakh. Work on the bypass is expected to start this month and basic road connectivity will be complete by March-end, said an official of the Public Works Department. Deputy Commissioner Shrikant Baldi said once completed, the bypass would help in promoting tourism in the area . “Since approval from all departments have been got, besides the financial sanction, the project is expected to be completed in months,” he said. Mr Santosh Sharan, a travel agent in the area, said the bypass would ensure that tourist cabs did not have to make repeated halts in congested Dharamsala markets. It would also save the locals from traffic snarls. For the parking lot, Ms Chandresh Kumari suggested that the building of the state library, which had been declared unsafe, could be converted into a parking lot by shifting the library to another place. The forest officials continued their drive even in the bad weather. The department had earlier issued a 15-day notice to these jhuggi dwellers to shift, otherwise they would be forcibly evicted. Divisional Forest Officer Hari Singh Dogra claimed that the eviction operation was completed without little resistance from them. Instead, they cooperated with the officials to leave their premises. Two labourers, Rajesh and Arun Kumar, were in tears and told reporters that they were cheated by those in power. These people had taken votes from them during the last Lok Sabha and Vidhan Sabha elections and even in civic body poll and had also made their ration cards. Arun Kumar, who is having twins of just six months, was unable to bear the shock of eviction. He said they had been living here for the past 35 years. Meanwhile, people of the Housing Board colony welcomed the eviction of these labourers. They said these persons were instrumental for polluting their surroundings, thus harming the cause of environment. A forest officer said the eviction work in rest of the forest areas would continue and all forests would be got vacated from encroachers. According to the reports received here, Dr Sharma (77) was murdered with a motive to loot money and other valuables as he used to stay alone at his house which made him a soft target for criminals. The police investigation revealed that Dr Sharma was murdered in a planned way as the assailants first handcuffed him, tied string and bandages around his throat before he was strangulated to death. “His body and face bore surgical bruises and string around the throat. It is a planned murder”, said the DIG, Central Range, Mr O.C. Thakur. According to neighbours. Dr Sharma has six daughters and used to run his clinic in the town after retirement. The police has lodged an FIR under Sections 302 and 457, IPC, the police said.